One of the most wonderful aspects of working with KIBO is the ability to incorporate art, crafts, and building. Through a combination of imagination and art, students can transform KIBO into almost anything: a character in a story, a vehicle in a city, an animal in the jungle. But the hands-on construction and artistic inspiration doesn’t stop with decorating KIBO. Creating an environment for KIBO to move around in can be just as engaging for the students – and important to the curriculum. A floor map – whether an existing classroom rug or a whole world created from scratch by the students — is a perfect complement to KIBO’s tangible, hands-on approach to coding. KIBO’s journey across the floor map becomes a story told by the children who program it. Through a combination of code and imagination, a floor map becomes a world for children to enter and explore with KIBO. A floor map can represent a physical space, like a student’s neighborhood, an animal’s natural habitat, or the solar system. It can represent an imaginative space, like the setting of a storybook. And it can even be a concrete representation of an abstract space, such as a palette of all of the class’ favorite things, a number line, or a coordinate grid. Download the FREE Floor Map Guide Today! 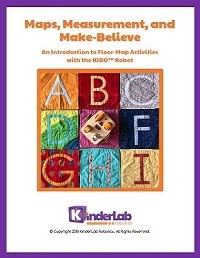 Get the “Maps, Measurement, and Make-Believe – An Introduction to Floor-Map Activities” guide today for 8 activities using floor maps to address learning standards when using KIBO. Floor map activities get kids moving and collaborating in physical space – enhancing the strengths of using KIBO in the classroom. Are your students learning about standard and non-standard units of measurement? Ask them to create a “KIBO Ruler” by measuring how far KIBO travels with a single Forward movement block. They can estimate distances between destinations in “KIBO units” on a classroom rug or floor map; then they can test their predictions by creating and running the program they made. Close this experience by measuring these same distances with scientific tools like rulers and measuring tape. Activities like this provide a natural connection to mathematics and geometry through measurement and estimation of distances. But the technique of creating a physical space for KIBO to explore – giving children concrete representations to think with – can span all the disciplines. Floor maps of storybook worlds, countries, neighborhoods, and even simple picture grids can provide connections to any subject. Floor map activities get kids moving and collaborating in physical space around concrete objects – enhancing the strengths of using KIBO in the classroom.